Constituting the most important group of microorganisms that offered to human consumption through food, yeasts are a substantial part of microflora in dairy products. Due to sophisticated enzyme production especially high proteolytic and lipolytic activities, some of the yeast species play an essential role in many processes such as fermentation, ripening, production of aroma precursors and deterioration in dairy product indicating these products as a source of extracellular enzyme producer yeast strains. In this study, butter samples were collected from delicatessens and grocery stores in different locations in İzmir province in order to isolate enzyme producers. A total of 40 yeast strains were isolated and investigated for their lipase, protease and amylase activities on solid medium consisting of tributyrin, skim milk and starch, respectively. Sixteen yeast isolates were found to be positive for enzyme production. Lipase and protease activities were observed in 11 yeast strains (68,75%), while only one yeast strain (6,25%) was found to be positive for protease and amylase production. 4 of yeast strains (25%) were able to produce only lipase enzyme. Molecular characterization of the yeast strains based on 26S rRNA region D1/D2 domains revealed that the isolates belonged to Candida zeylanoides (62,5%) and Pichia fermentas (37,5%) species. 1. Illanes, A, Cauerhff, A, Wilson, L, Castro, G.R, Recent trends in biocatalysis engineering, Bioresource Technology, 2012, 115, 48-57. 2. Adrio, J.L, Demain, A.L, Microbial enzymes: Tools for bio-technological processes, Biomolecules, 2014, 4(1), 117-139. 3. Choi, J.M, Han, S.S, Kim, H.S, Industrial applications of en-zyme biocatalysis: current status and future aspect, Biotechnol-ogy Advances, 2015, 33(7), 1443-1454. 4. Prakash, D., Nawani, N., Prakash, M., Bodas, M., Mandal, A., Khetmalas, M., Kapadnis, B, Actinomycetes: A repertory of green catalysts with a potential revenue resource, BioMed Re-search International, vol. 2013. 5. Sanchez, S., Demain, A.L, Enzymes and bioconversions of industrial, pharmaceutical, and biotechnological significance, Organic Process Research & Development, 2011, 15(1), 224-230. 6. Singhania, R.R, Patel, A.K, Pandy, A, The industrial production of enzymes. In: Soetaert W, Vandamme E.J (eds) Industrial Biotechnology: Sustainable Growth and Economic Success, John Wiley & Sons, Germany, 2010, pp 207-225. 7. Champagne, C.P, Laing, R.R, Roy, D, Mafu, A.A, Griffiths, M.W, Psychrotrophs in dairy products: their effects and their control, Critical Reviews in Food Science & Nutrition, 1994, 34, 1-30. 8. Ledenbach, L.H, Marshall R.T, Microbiological spoilage of dairy products. In: Sperber WH, Doyle MP (eds) Compendium of the Microbiological Spoilage of Foods and Beverages, Springer, New York, 2009, pp 41-67. 9. Global markets for enzymes in industrial applications.. http://www.bccresearch.com/pressroom/bio/global-market-industrial-enzymes-reach-nearly-%247.1-billion-2018, 2014 (accessed 26.01.2017). 10. Kirk, O, Borchert, T. V, Fuglsang, C. C, Industrial enzyme applications, Current Opinion in Biotechnology, 2002, 13(4), 345-351. 11. Demain, A.L, Adrio, J.L, Contributions of microorganisms to industrial biology, Molecular Biotechnology, 2008, 38(1), 41-45. 12. Fossi, B.T, Tavea, F, Jiwoua, C, Ndjouenke, R, Screening and phenotypic characterization of thermostable amylases produc-ing yeasts and bacteria strains from some Cameroonian soils, African Journal of Microbiology Research, 2009, 3(9), 504-514. 13. Liu, D, Coloe, S, Baird, R, Pedersen J, Rapid mini-preparation of fungal DNA for PCR, Journal of Clinical Microbiology, 2000, 38(1), 471. 15. Kumar, S, Stecher, G, Tamura, K, MEGA7: Molecular evolu-tionary genetics analysis version 7.0 for bigger datasets, Mo-lecular Biology and Evolution, 2016, 33(7), 1870-1874. 16. Limtong, S, Kaewwichian, R, Jindamorakot, S, Yongmanitchai, W, Nakase, T, Candida wangnamkhiaoensis sp. nov., an ana-morphic yeast species in the Hyphopichia clade isolated in Thailand, Antonie van Leeuwenhoek, 2012; 102(1), 23-28. 17. Lopandic, K, Zelger, S, Banszky, L.K, Eliskases-Lechner, F, Prillinger, H, Identification of yeasts associated with milk prod-ucts using traditional and molecular techniques, Food Microbi-ology, 2006; 23(4), 341-350. 18. Sagdic, O, Ozturk, I, Bayram, O, Kesmen, Z, Yilmaz, M.T, Characterization of butter spoiling yeasts and their inhibition by some spices, Journal of Food Science, 2010, 75(9), M597-603. 19. Fleet, G.H, Mian, M.A, The occurrence and growth of yeasts in dairy products. International Journal of Food Microbiology, 1987, 4(2), 145-55. 20. Corbo, M.R, Lanciotti, R, Albenzio, M, Sinigaglia, M, Occur-rence and characterization of yeasts isolated from milks and dairy products of Apulia region, International Journal of Food Microbiology, 2001, 69(1), 147-152. ISNAD Çorbacı, Cengiz , Uyar, Ebru , Yalçın, Hüsniye Tansel . "Determination of Enzyme Profiles and Molecular Characterization of Yeast Species Isolated from Butter Samples". 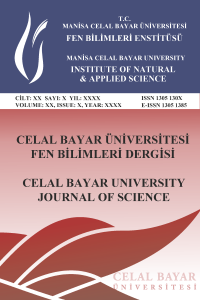 Celal Bayar University Journal of Science 13 / 4 (December 2017): 833-837.